Study and do homework in a quiet area to allow for concentration. Review information in small doses prior to a test so you will retain information and feel confident with the material on test day. Ensure that you arrive on time, or even a little early, so you avoid feeling late and flustered when you sit down to begin the exam. Breathing exercises can help you calm down. Inhale slowly and deeply through the nose and exhale slowly through the mouth. Repeat as needed throughout the test to relax yourself. Exercise increases overall health and improves mood. Regular exercise provides excellent stress-reducing benefits. As with anything, practice makes perfect. Test anxiety will not go away overnight, but facing and dealing with it consistently over time will help to manage it. What test-taking, stress-reducing techniques do you use? 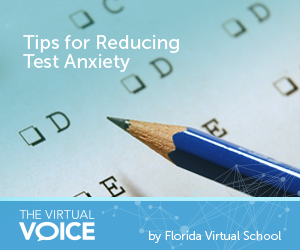 For more information and test-taking tips, join the FLVS Counselors in our upcoming webinar College Test Preparation: SAT, ACT, & PERT for some strategies that are sure to help you succeed on test day! 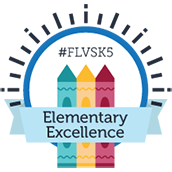 Login on Wednesday, April 16, 2014, at 6:30 p.m. EST at www.tinyurl.com/FLVSCounselors. 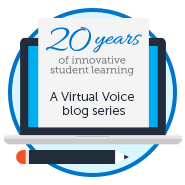 This entry was posted in Student Edition and tagged Assessments, FLVS Counselors, Student Success, Test Anxiety, Tests, Tips for Students on April 9, 2014 by Amy LaGrasta.